Oh boy, that’s a mouthful. I’ve mentioned before that I am not the best recipe namer on the block, and if you didn’t believe me then, I suppose you do now. Instead of cleverly coming up with that all-descriptive yet succinct title that will perfectly describe a certain dish, I more often than not let myself ramble on with a name that reads like a list of ingredients. I know, there goes my career in editing. Thankfully, I don’t aspire to be an editor, and truth be told, don’t know if I even aspire to be a writer either. Or am I already a writer just because I, um, write? It seems to me that one needs to reach some sort of pinnacle of writer-hood, some summit of eloquence, to be called a WRITER. Right? right? I may check in here every so often (not as often as I’d like though…sigh). I may even string a few words together over here. But in reality I am a pencil pushing, keyboard clicking, cog in the machine. Maybe, maybe, in some alternate universe all this, this blog, this writing, this obsession with all things gastronomic, is actually my life. In this universe though, it is just my hobby. A hobby I LOVE yes, but a hobby nonetheless. And perhaps because it is just a hobby, food and writing and I will forever be on honeymoon, never to fall into the grittiness of reality. Or perhaps our relationship, never having the chance to plunge in to that very grit of the everyday, will never have anything more deep than a surface sparkle. Or maybe I’m just a girl who thinks too much. – Melt the butter in a skillet until browned (not burned! ), with a warm nutty aroma. You can find a fantastic tutorial on browning butter over at Simply Recipes. Strain and set aside to cool. – Make your crumble: Rub flour and butter together with your fingers, or with a pastry cutter, until it forms coarse crumbs. Mix in the sugar and nuts. Set aside in the refrigerator until ready to use. – Butter a 8-inch cake pan and lay your pear cubes at the bottom of the pan. – Mix the sugar with the egg. Whisk your flour and baking powder together, then add to the egg mixture. Add the (cooled) brown butter. Pour the batter over the pears. – Get your crumble mixture and sprinkle over the top of the batter until fully covered. You may not use it all**. – Bake in a 180C (350F) oven for 40-50 minutes or until a pick inserted in the middle of the cake comes out clean. – Let the cake rest in its pan for about 5-10 minutes. Turn out into a plate, and then turn over onto another plate so the pears are on the bottom and the crumble on top. C‘s mom gifted us with a bunch of pears that sat prettily on our dining room table until I finally came around to using them. I was thinking more in the lines of pie until this recipe, and my desire to make something with brown butter, serendipitously collided. I’m so happy they did. 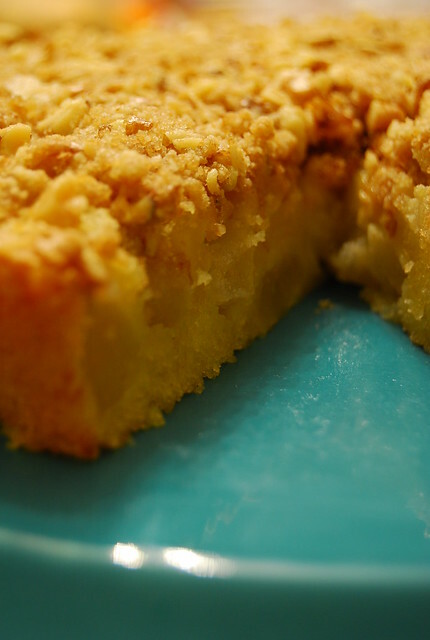 This cake is all Clotilde promised it to be — golden, moist, light — and the additional step of browning the butter lends it a deep nuttiness that I think works marvelously with the pears’ sandy sweetness. 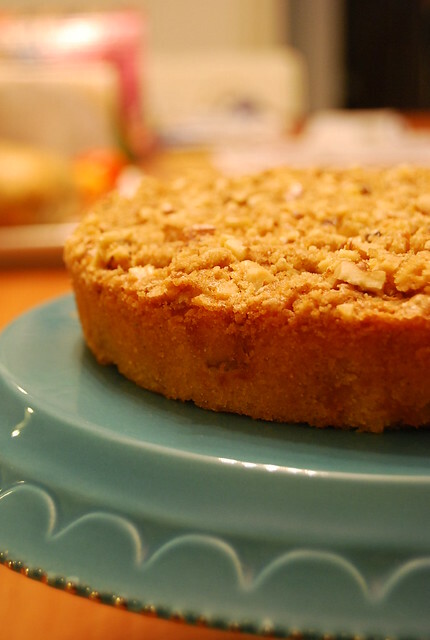 The crisp crumble topping is the perfect contrast to the cake’s yielding softness. Served warm with a scoop of vanilla ice cream, or straight out of the fridge for breakfast, this cake can do no wrong…and I hope I haven’t done it a sore disservice with the long-winded name. Hobby or not, I love food — its making and its consumption. I love this blog. And I especially love all of you who have kept on reading through low times and high. **If you don’t use all your crumble mixture, keep it in the fridge. The next morning cube some fruit into a oven-safe dish, top with the crumble, and pop in the oven until the crumble is crisp and the fruit is soft and juices bubbling. Top with yogurt. Breakfast! That is a cake recipe for me. Love pears and the crumble. I will take the recipe to try. Thanks for sharing. What a gorgeous golden cake. I love that shot of the inside. It's enough to make anyone hungry. Hi Ling! Glad to be of service! Hi Rosa! I am really in love with this cake from Clotilde, especially after browning the butter! Hi Lisa! And it's such a snap to make! Haha… I think the definition of a writer is… wel someone who writes. Or would it be the definition of someone who writes for a living? I am not sure really, but then I have heard that writing for a living is certainly not very profitable (unless your name is JK Rowling or such) so to me you are a writer! And that cake… now THAT is what I call delicious! Just the mention of brown butter has me salivating. I love the chunks of pear in it too! Yum! Did you use real pears (the kind not usually found in the Philippines) or the ones they sell in the supermarket, the yellowy ones? Oh my! My decision to go on a diet just crumbled apart when I saw your post 🙂 The cake looks so tempting! It is a very inviting cake. Love this! The name, the color, the crumble! :))) Would be great with apples too i suppose. Yummy, brown butter smells so good! I bet this cake is heavenly! i'm rather certain you are a perfectly awesome at naming blogs/recipes. the title of this blog tugged at my heart strings- going to have to make this SOON! There's nothing wrong with being a 'a girl who loves cake…' The recipe looks amazing and I'm looking forward to trying it out. Thanks! Hi Junglefrog! I can definitely live with that definition 😉 Thanks! Hi Veron! Me too! It was all I could do not to stick my face in the bowl for the smell! Hi Mom-Friday! Yes, you could indeed make it with apples – the original incarnation on Chocolate & Zucchini is with apples 🙂 An award! Thank you! Hi Chef D! Oh boy…you said it! The smell is so enticing! Thank you Meaghan! Hope you like it! You are a writer because you write. Getting to the keyboard or journal or parade of post-it notes and ordering thoughts is all you need to do to qualify! I love your blog and always look forward to new posts! I love how pears add a fudgy texture to cake, amping up the moistness and adding a little sugary oomph to the finished product. And brown butter? Nutty without the nuts! Hello Joey. I've been lurking since late 2007 and I finally can't stand it. I HAD to comment! I love your site and I have bookmarked tens of baking (and non-baking) posts from your site. I very recently got an oven (an electric one, though) and I am absolutely RARING to get baking. Would you or any of your readers be able to help me: can my little electric oven do the same things as the bigger, mre sophisticated gas ovens do? bake bread and cakes? Roast veggies? Make creme brulee? Hi Stargazer! I’m so glad you have been enjoying my site…and thank you for finally commenting! 🙂 I am not an experienced baker myself so all I can say is Go Go Go! You will have lots of fun and sweet stuff to eat afterwards 🙂 With regards to the oven, you should be able to bake in your electric but what you bake (or cook) in it will depend on what temperatures it can reach. My advice is to get an oven thermometer so you make sure that you are at the temperature the recipe calls for (very important in baking). Hope this helps! I love cakes with delicious crumbles, this sounds fantastic! Oh lord! that cake and a cup of coffee and I will be in pig's heaven. Hi Carlos! With some coffee definitely! I love crumble cakes, Joey! And pears do not get all the attention they deserve in baking. Delicious! My 11 year old was looking for somoething tasty to cook today (Sunday). It's our day to play in the kitchen. He found this and we are drooling over the keyboard. One of my favorites! Works well also with fresh apples or even canned pears.